We know that the San Andreas fault produces large earthquakes and that many other faults are also hazardous. However, it is often difficult to understand how to incorporate this information into our lives. Should we care only if we live near the San Andreas fault? Is every place just as dangerous? This section describes where earthquakes have occurred in the past and where they may likely occur in the future, how the ground will shake when they do, and what may happen in a plausible "big one" on the San Andreas. To become familiar with earthquake vocabulary, you may want to read the "What Should I Know" section first. The earthquakes of California are caused by the movement of huge blocks of the earth's crust- the Pacific and North American plates. The Pacific plate is moving northwest, scraping horizontally past North America at a rate of about 50 millimeters (2 inches) per year. About two-thirds of this movement occurs on the San Andreas fault and some parallel faults- -- the San Jacinto, Elsinore, and Imperial faults (see map). Over time, these faults produce about half of the significant earthquakes of our region, as well as many minor earthquakes. Larger imageEarthquakes plotted on this map (at their epicenters) include: significant earthquakes since 1850 as red numbered circles corresponding to the table at left; earthquakes larger than magnitude 5.5 (1850-1932) and magnitude 4 (1932-2008) as orange and red small circles; and earthquakes smaller than magnitude 4 (1933-2008) as blue dots. While there are thousands of earthquakes shown, this is only a very small window on the earthquake history of southern California! For maps of recent earthquake information see here. Larger imageSCEC Community Fault Model This map shows the 3-dimensional structure of major faults beneath Southern California. Vertical faults such as the San Andreas (red band from top left to bottom right) are shown as a thin strip. Faults that are at an angle to the surface are shown as wider ribbons as they lie beneath broad areas (the nearest fault to you might be a few miles beneath your home). Areas that seem to have few faults can still experience strong shaking from earthquakes on unmapped faults or from large earthquakes on distant faults. The rate of plate movement along the San Andreas fault, 33 millimeters (1.3 inches) each year, is about how fast your fingernails grow. As a result, Los Angeles City Hall is now 2.7 meters (9 feet) closer to San Francisco than when it was built in 1924. It would take a mere (geologically speaking) 2 million years for your nails to extend 100 kilometers (60 miles) from San Bernardino to Palmdale. It took many millions of years of movement on faults (earthquakes) to shape Southern California's current landscape. The last significant earthquake on the Southern California stretch of the San Andreas fault was in 1857, and there has not been a rupture of the fault along its southern end from San Bernardino to the Salton Sea since 1690. It is still storing energy for some future earthquake. But we don't need to wait for a "big one" to experience earthquakes. Southern California has thousands of smaller earthquakes every year. A few may cause damage, but most are not even felt. And most of these are not on the major faults listed above. The earthquake map above shows that earthquakes can occur almost everywhere in the region, on more than 300 additional faults that can cause damaging earthquakes, and countless other small faults. Larger imageA schematic block model of Southern California showing the motion of the Pacific and North American plates, and the big bend of the San Andreas fault where the plates squeeze together. This is mostly due to the "big bend" of the San Andreas fault, from the southern end of the San Joaquin Valley to the eastern end of the San Bernardino mountains (see diagram at right). 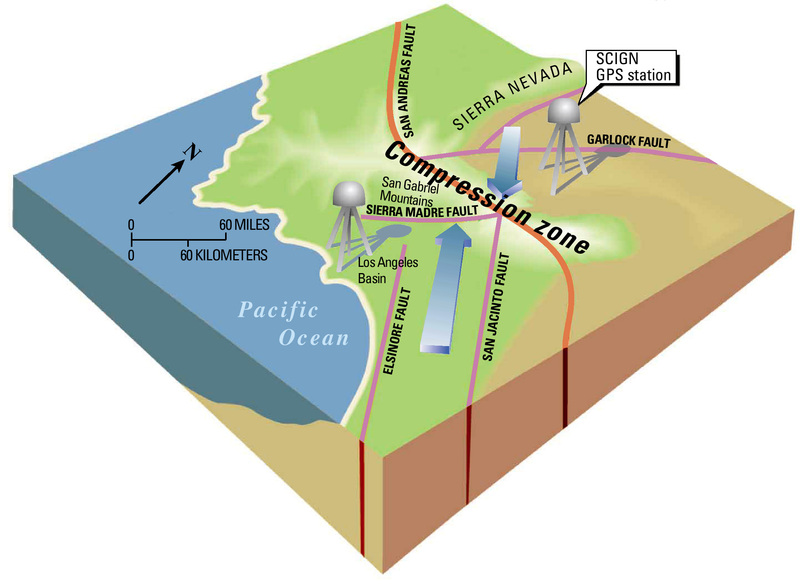 Where the fault bends, the Pacific and North American plates push into each other, compressing the earth's crust into the mountains of Southern California and creating hundreds of additional faults (many more than shown in the fault map). These faults produce thousands of small earthquakes each year, and the other half of our significant earthquakes. Examples include the 1994 Northridge and 1987 Whittier Narrows earthquakes. "BIG EARTHQUAKES ALWAYS HAPPEN IN THE EARLY MORNING." This myth may be so common because we want it to be true. Several recent damaging earthquakes have been in the early morning, so many people believe that all big earthquakes happen then. In fact, earthquakes occur at all times of day. The 1933 Long Beach earthquake was at 5:54 pm and the 1940 Imperial Valley event was at 8:37 pm. More recently, the 1992 Joshua Tree earthquake was at 9:50 pm and the 2003 San Simeon event was at 11:15 am. It is easy to notice the earthquakes that fit the pattern and forget the ones that don't. See the web resources listed here.